The Base and Navalny: How Can the Left Work with the Anti-Corruption Movement? Over the last several months, it has become clear that Alexey Navalny and his anti-corruption/ presidential campaign have become the most effective vehicles for galvanizing the pent-up social and political grievances most Russians hold. Navalny is a peculiar figure, not easily describable by foreign analogies (and hardly as “Russia’s Trump”, as Alexey Sakhnin and Per Leander called him in a recent Jacobin article). He is certainly not of the left, but in another Jacobin article, Ilya Budraitskis, Ilya Matveev, and Sean Guillory have argued that the Russian left could benefit from the political opening his figure has provided and should be open to participating in those parts of his movement that create democratic opportunities (a suggestion for which they have received much hate-mail). Adding to the Navalny debates among the Russian left, LeftEast offers Oleg Zhuravlev and Kirill Medvedev’s article that originally appeared in Russian on September.media and was generously translated for us by Joseph Livesey. We should draw a line between the movement for democratization and against Putin, on one side, and the figure of Navalny on the other. We need to support the movement for democracy and against authoritarianism and corruption. This movement in Russia has become newly energized, expanding even further after the protests of March 26 and June 12, when thousands of people came out into the streets, not just in Moscow and St. Petersburg, but in other regions as well. It goes without saying, this is a progressive movement. Its growth is one of the few realistic chances for social and political change from below. 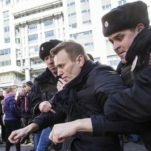 Alexei Navalny arrested at an opposition protest. We have to recognize the fact that Navalny has been the most successful at claiming the role of the leader of this movement. He is a popular politician, an effective organizer, and a compelling speaker. He has managed to combine an election campaign with protest mobilization, in doing so creating a point of growth for the movement as a whole. In our opinion, Navalny is successful as a “manager” of the movement, but a number of his actions (the last of which being the sudden and unilateral decision to change the venue of the June 12 rally) indicate that without control from below, from ordinary activists and democratic institutions within his organization, he could turn into an authoritarian leader. The parallels with Boris Yeltsin do not seem too far-fetched. We have already seen a seemingly progressive politician who opposed corruption, nepotism, and elite privilege, and spoke out about making life better for ordinary people, become an authoritarian president, stifling democracy in Russia for decades, having given a free hand to the same oligarchic elites that Navalny is now attacking. That happened partly because Yeltsin was the leader of the masses, not a representative of a movement. Rather than being a genuine organizing principle, democracy was just a slogan. We must not make the same mistake. We need to make it totally clear: you can only rely on a democratic movement (which, of course, will have leaders), not on an all-powerful leader, even if that person is demanding the democratization of the political system. It is important to distinguish between Navalny’s rhetoric and his political agenda. The evolution of his rhetoric, from a sweeping critique of authoritarianism and uncovering particular instances of corruption, to condemning unequal income distribution and attacking oligarchs, has been genuinely progressive. These developments have had an influence not just on Navalny’s supporters, but also on the common sense of the whole protest movement. If we look at Valery Balayan’s film Huizmisterputin, it is clear that opposition rhetoric as a whole has taken a lead from Navalny’s “populist turn.” In the film, we don’t see any more of the typical liberal dichotomy of the 1990s as a time of freedom, with the 2000s marked by transition to “dictatorship.” Instead, we see a critique of the entire post-Soviet political-economic order, and its basis in the expropriation of wealth from the population. We are shown Putin and his late mentor and former mayor of St. Petersburg, Anatoly Sobchak, using the Russian economist and politician Yegor Gaidar as a front to sell national assets abroad as early as the 1990s. Another example of this shift in the protest movement’s overarching common sense is found in protesters’ “mass consciousness.” Interviews conducted by the Laboratory of Public Sociology at the most recent protests show that the rhetoric of ordinary protesters has shifted towards social issues. We hear in these interviews the same kinds of phrases used back in the May 2012 Bolotnaya Square protests in Moscow—the country needs a turnover of who is in power, honest elections, and independent courts, along with which the solutions to other problems will fall into place—but that rhetoric no longer seems so dominant. Young people are openly critical of the social system that has emerged in the Russian Federation, where they see a minority who “have everything, while the majority have nothing.” When asked about the main issues facing the country, many of the interviewees answered: low pensions, unemployment, lack of a social safety net. It is clear that Navalny’s grassroots work—traveling around the country, conversations with locals, campaigning—is part of what laid the grounds for this expanded agenda, which in turn has led to a broadening of social support for the protests. However, Navalny’s rhetoric, which draws heavily on social justice themes, is not the same as his political agenda. It’s still not clear what his economic policies are, or what measures he proposes to reform the Russian economy and political system. His recent debate with Strelkov again showed that Navalny’s basic “policy” is fighting corruption, something that alone will not bring about social justice. Projecting an image of being a “realist” in contrast to Strelkov the “zealot” (“Do you want to restore the monarchy and reunite Russians from all over the former USSR? Well I want Russians to have it good right here, right now!”), Navalny replaced realism with a neoliberal rationality, as if that is the only feasible version of political pragmatism. As if all it comes down to is saying: let’s see if we can make money some way or other, then politicians doing what’s necessary to deregulate the economy, and we’ll all make money! Being realists ourselves, we are opposed to neoliberal approaches to economics and politics. The left is all for pragmatism, but we know that the pragmatism of an entrepreneur or a banker is very different, often completely contradictory, to the pragmatism of the state when it works in the interests of its citizens. But neoliberal “common sense” doesn’t distinguish between them. In our view, we should take advantage of Navalny’s use of leftist rhetoric, and his inclusion in public discussion of issues that are essential to the social-democratic agenda (not to mention the socialist agenda). At the same time, we can’t rely on his political program—even if right now it contains individual items that favor a redistribution of wealth, those could soon easily disappear. That’s why we need to draw a line between Navalny himself and the protest movement, just as we should see the difference between his rhetoric and his policies. We must take part in the protest movement and support the “shift” in his agenda to the left, but we mustn’t rely on Navalny as leader. We can only rely on a democratic movement with a clear set of goals for economic and socio-political change, based on the work of experts, not just opinions that sound convincing. What is the Russian Protest Movement? Does it all come down to Navalny? Despite the fact that Alexei Navalny is the most successful political leader on the protest scene, the protest movement does not just come down to him, his staff, or even his supporters. The 2012 Bolotnaya Square protests have their own separate legacy, which receives less media attention, but has no less potential as a result. Since 2012 local and social movements have been rapidly developing in many districts of major cities, and a movement of candidates to contest municipal deputy seats has emerged. Though less politicized than Navalny’s campaign, these movements are numerous, well versed in the pressing problems faced by ordinary people, and oriented towards opposing the current political regime at all levels. Moreover, these movements are more politicized and radical than the Bolotnaya protests. At the rallies in 2011-2012 people spoke out on behalf of “all honest citizens” against a “bad” immoral president. The evolution of protests by local activists and movements of candidates for municipal elected office have led to a situation where the public perception of a conflict between “the people” and “the powers that be” has become much more pronounced. Russia’s ruling political party “United Russia” is no longer just a symbol of everything wrong with the country (unfair elections and corruption), it is now perceived in the guise of local construction and planning developers, government officials, and security services. We haven’t got to class struggle yet, but there is nonetheless a definite intersection of the socio-economic and the political. Another achievement of these movements is bringing together the activist agenda of “small deeds” and opposition political claims. Many activists have come to the conclusion that, as one of the Laboratory of Public Sociology’s interlocutors put it, “if we don’t vote, the storm drains in the city are never going to work.” The formula “real achievements are impossible without politics, and politics is meaningless without real issues” is a progressive take that is helping to form a network of activists, experts, intellectuals, and organizers, capable of acting and working at different levels, from electoral campaigning to managing home owners associations, from working out reforms to organizing projects that benefit communities. In the end, these movements are fundamentally democratic. It’s what makes most of them tick. They select their own representatives, adopt codes and statutes, and hold discussions about leadership and equality. 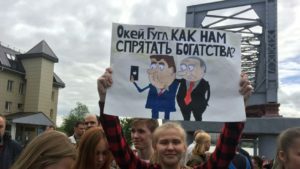 It’s no coincidence that on June 12 in Moscow, local and civic activists demonstrated their independence by rallying separately from Navalny’s supporters. What Should the Left Do? In our opinion, people on the left should stand solid with opposition activists who are being repressed, including participants in rallies organized by Navalny. Without basic solidarity and mutual support we won’t make it. We also think leftists should take part in the current protest movement, while criticizing Navalny. How exactly? First, we need to be involved immediately in two “parts” of the protest movement in Russia—both in the rallies organized by Navalny, and in civic, local, and municipal activist groups. At rallies, which, thanks to left-leaning opposition rhetoric, attract more and more people who are vulnerable and in need of social care, we should be discussing ideas and proposals related to combating inequality, taxation, the nationalization of major industry, and so on. At the same time, it’s important to take part in local social movements and initiatives. It’s imperative that we facilitate bringing into line the political, local, and socio-economic agendas of candidates for municipal elected office with local social movements. Struggling against the essentially anti-social neo-liberal measures of today’s government could be the most important work they do. We also have to promote the development of these movements’ internal democratic processes. This will guarantee the equality of those taking part, and a democratic leadership—both crucial in strengthening these movements’ role in “actual” politics. The left’s participation as grassroots activists and leaders in these groups will bolster the position of the leftist movement in politics, and the “red” agenda in social struggle. Second, we need public discussion, not just about Stalinism and historical memory, but of key issues in the future. People on the left, who bring together scholarly analysis and a political vision, could become principled and prominent opponents of liberals and conservatives in conversations about economic, social, and political reform projects. Debates that involved leftist activists, intellectuals, and experts would not only be more interesting and absorbing than the debate between Navalny and Strelkov, they would allow the left, in some areas, to act as a tactical ally of Navalny’s, and, in others, to occupy the role of principled opposition to him—in both cases, on an equal footing. Third, the left needs its own program of socio-political and economic reforms. We’ve got to show at the level of concrete measures that our program to stand up to the oligarchs, and for social equality and prosperity is more consistent, realistic, and at the same time radical than the program of Alexei Navalny. Navalny’s anti-corruption investigations and the mobilization they have brought about are undeniably progressive. Still, the nationalist tendencies and neo-liberal implications of his program are a threat to the movement for freedom and justice. The leftist-populist elements of his program are tailored to the current situation and are hardly binding in the event that he gets into power. The Left must be part of the protest movement, including Navalny’s rallies. But we also need to realize the diversity of civic initiatives, to strive to promote our ideas and arguments in different settings, and to do so in a variety of ways—from grassroots activism to public debates. 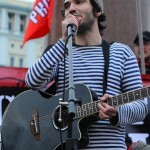 Kirill Medvedev is a Moscow-based poet, translator, activist and a member of the Russian Socialist Movement. 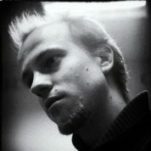 Oleg Zhuravlev is a researcher at the Public Sociology Laboratory (Russia), which he and his colleagues founded in 2012. He is also a PhD-candidate at the European University Institute (Italy) and teaches at the School of Advanced Studies, Tyumen, Russia.